The Chicana/o Civil Rights Movement, or simply the Chicana/o Movement, was a decentralized liberation movement that emerged during the 1960s and 1970s alongside other liberation movements across the globe. The movement was part of the ethnic Mexican civil rights struggle in the United States that began with the 1848 Treaty of Guadalupe Hidalgo and continues into the twenty-first century. Though the Chicana/o Movement has no clear beginning or ending, it can be traced through various civil rights and culturally focused organizations that pressed for ethnic Mexican empowerment. The approaches of these organizations differed. For instance, the Brown Berets emerged in Los Angeles in 1966 as a paramilitary group. The Brown Berets inspired chapters across the nation that protested the Vietnam War and police brutality. In cooperation with Brown Berets and independently, students initiated “blow-outs,” or school walkouts, in Texas, California, New Mexico, and other states to protest unequal education. Founded in 1969 in South Texas, La Raza Unida Party (The People’s Party) aimed to use the ballot box to empower Chicana/os through the political system. Other organizations, including the Hijas de Cuauhtémoc, created spaces for women’s empowerment within the often male-centered liberation movement. Overall, the Chicana/o Movement was a series of localized, social justice movements that were more militant and louder than previous efforts by ethnic Mexicans to obtain social equity. The achievements of the Chicana/o Movement include the emergence of Chicana/o Studies, the presence of ethnic Mexican scholars and students on college campuses, as well as the greater inclusion of Mexican origin people in politics and popular media. While concentrating upon the Chicana/o Movement in major urban centers, scholars have largely marginalized Chicana/o activism in the mostly rural Southern Plains. Yet, the Southern Plains was home to a burgeoning wing of the Chicana/o Movement that initiated a transformation of the region’s society. This digital history project traces that movement over time and space through an interactive map and timeline. 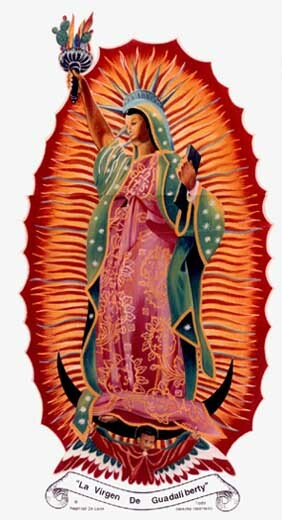 La Virgen de Guadaliberty, courtesy of plains-origin artist and writer Nephtalí de León.